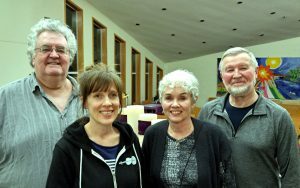 Dr. Harris Loewen, retired professor of Choral Music of Brock University, and his wife Ruth, attended a VAMC choir rehearsal on March 18. Dr. Loewen spent some very productive time rehearsing “Peaceful Niagara”, one of his many choral compositions and a piece to be included in the VAMC’s June 2 concert, “Our Home: A Canadian travelogue…”. It was a wonderful opportunity for the choir to gain insights into both choral singing and this particular piece from one of Canada’s finest choral conductors.